Travelling around Africa is in itself an experience. However, it can also be incredibly expensive – especially for South Africans. From gorilla trekking to luxury safaris and expensive flights, costs can quickly add up making it impossible to stay within an affordable budget. Luckily, some of Africa’s most popular destinations are backpacker friendly. It’s easier than ever to soak up the culture and have the African adventure of your dreams. 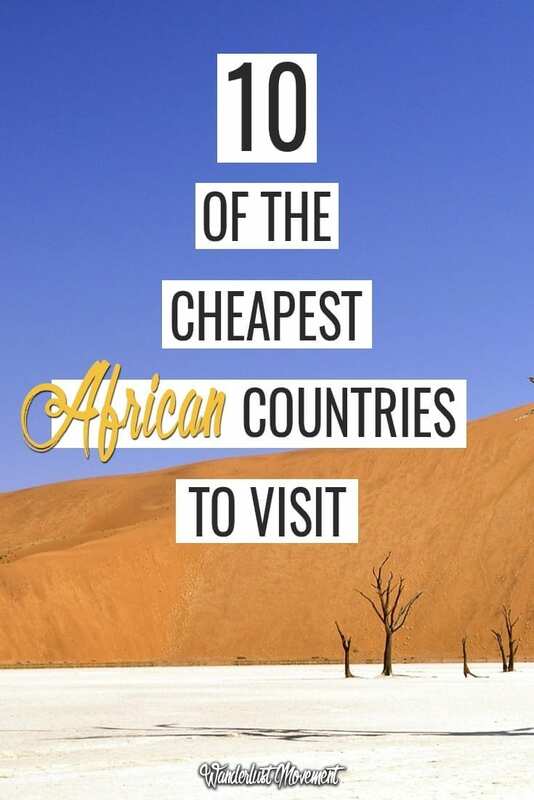 So if you’re looking for a frugal escape and don’t want to venture too far, here are 10 cheapest African countries to visit on a budget! Rwanda’s tragic past, rich culture and incredible wildlife make it one of the most intriguing places to travel to in Africa. Kigali is the pulse of the country’s cultural attractions. With its genocide memorials and thriving art scene, it’s a must-visit for history buffs and culture vultures. Kigali is also one of the cheapest African cities to visit as a South African. While the backpacking scene is still growing, there are a few hostels to choose from that won’t break your budget. Avoid the fancy restaurants, eat local or cook your own food, and you can easily survive on under R 300.00 per day. And for those that want to experience the country’s natural beauty, Kigali is only a day trip away from the famous Volcanoes National Park. Visa Requirements for South Africans: Visa on arrival at $30 for 30 days. Budget travel and Egypt might not be the first thing that comes to mind when you think of this northern African country. 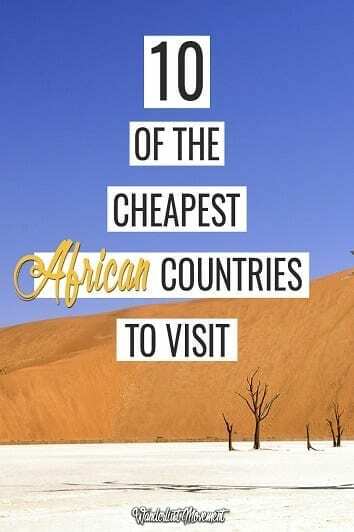 But it’s one of the cheapest African countries to visit if you’re on a budget. Flights will be your biggest expense, but if you follow these airfare saving tips, you might be able to score return tickets in the R 4000 range. With your day-to-day costs coming in at only R 250.00 per day, you’ll have more room to splurge on visiting the pyramids or even travelling further and scuba diving in the red sea. Visa Requirements for South Africans: You need to apply for a visa in advance, but there is no cost involved unless you go through a service provider. Armed with national parks on its doorstep, excellent museums and quirky sites – a trip to Nairobi, Kenya won’t disappoint for those looking for the cheapest African countries to visit. The best part is that Nairobi is within close driving distance to Hell’s Gate National Park and the famous Giraffe Centre which is more than enough reason to go here. But Kenya is more than another African safari destination. If you’re looking for an affordable African island getaway, go to Zanzibar. With return flights starting at R 4 600 and an average daily budget of R 260.00 it’s a frugal beach lovers paradise. Spend your days exploring this island’s dark past, rich culture, and some of the best beaches in the world. Zanzibar’s Stone Town and Prison Island are not to be missed if you want to learn more about the island’s dark history in the slave trade and how that created its unique culture. Ethiopia is a portal to another world. It’s the gateway to ancient place mixed in with it’s growing metropolis Addis Ababa. The capital is now Africa’s fourth largest city and is teething with some of the country’s best museums and traditional food. For vegan travellers, Ethiopia is heaven. More often than not, you don’t get to experience much of a country’s authentic dishes when you travel, but that’s not the case here. Traditional dishes are meat and dairy-free, packed with flavour and substance that won’t leave you hungry. It’s one of the best African cities for frugal vegans and worth budgeting a bit more to eat out at a few local restaurants. Visa Requirements for South Africans: Visa on arrival at R 236.00 / £14 for 30 days. If this is your first time exploring our neighbouring countries or travelling at all, Namibia’s capital city is for you. Windhoek is where the rugged Africa plains and modern culture meet. You’ll find misplaced German castles, Neobaroque cathedral spires in between the African urban buzz and sprawling national parks. Local transport: R 89.00 for a taxi with an 8 to 10 km distance. Livingstone is the perfect base for exploring Victoria Falls and adventure lovers. You’ll be only 11 km away from the mighty Zambezi and in prime position to explore the falls from the sky or wrestling its currents. 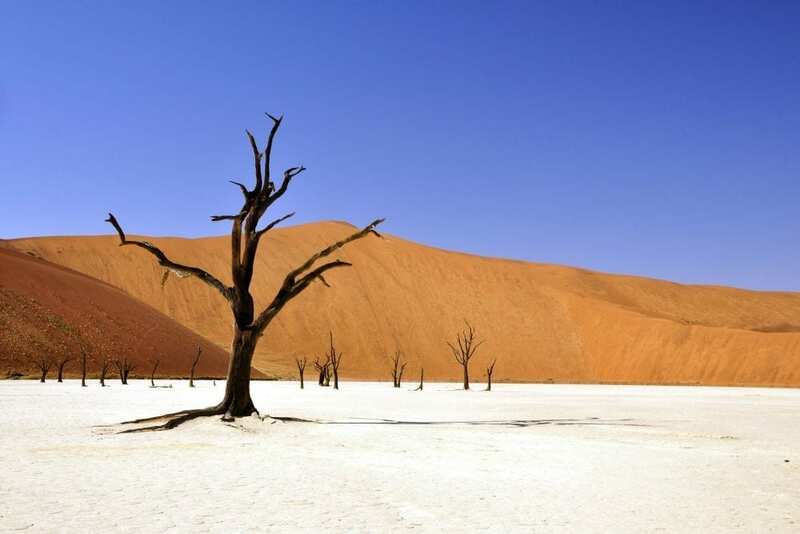 It’s also one of the cheapest African countries to visit, especially compared to prices on the Zimbabwean side. It’s Zambia’s backpacking mecca with affordable dorm rooms and affordable food making it possible to splurge on big ticket items like the Devil’s Pool. Local transport: Livingstone is small enough that you can walk, but a taxi to Victoria Falls costs $10 each way. The city is ideal for seasonal travellers, who like a little bit of edge. The capital isn’t a sprawling metropolis. Instead, it borders a wildlife sanctuary and is more a real jungle than a concrete one. But it’s also cheap with dorm beds going for R 156.00 per night and a day’s worth of meals costing under R 80.00 a day. It’s also the perfect base for day trips to the Ntchisi Forest Reserve, Kuti Wildlife Park and South Luangwa National Park. Mozambique was the first African country I travelled to for my 25th birthday. 19 countries later and it’s still right at the top of my list all thanks to Tofo. For adventure travellers looking for the cheapest African countries to visit, it’s one of the best options. Go diving with dugongs and dolphins for R 630.00 with equipment rental or spend a few hours snorkelling in the ocean with whale sharks for the same price. And you’ll have more than enough room in your budget for the endless adventure activities with cheap eats and dorm rooms in abundance. Local transport: You can walk everywhere, but a bus from Inhambane will cost R 5.00 one way. For those looking to escape to the desert and explore the beautiful architecture that Morocco is known for, head to Marrakech. With Morocco trending as a destination on Instagram, it’s affordability adds to its Instaworthy charm. Hostels boast rooms starting at R 100 a night, and you’ll get to experience all of Morocco’s delicious cuisine without breaking the bank. Plus there’s plenty to see without spending a dime. Head to Medina, and stroll around the old buildings and monuments while making pit stops at the Koutoubia Mosque, Saadian Tombs and soaking up its vibrant nightlife. Visa Requirements for South Africans: A visa is required and obtained at the embassy in Pretoria. It costs R 327.00 for a single entry. Hopefully, Africa no longer seems like an expensive destination and you’ve opened up a few more slots on your bucket list. Did I leave any cheap African countries off this list? But low on cash? Get your budgeting under control! Find out exactly how much your dream trip will cost and start saving up. Success! Check your email to download your FREE Budget Holiday Planner! This is an insightful article! I’m looking to travel more in Africa, so this will definitely help me. Thanks Lauren! Very interesting and helpful! I was just wondering what monetary unit you are using in the budgets? Thank you! South African Rands and US dollars. One thing I will say about Rwanda is that the gorilla permits are in fact expensive. The most expensive between the three countries to see the Mountain gorillas. Uganda is less and has almost a guarantee of seeing them at Bwindi and Virunga has a pretty good success rate and is even less. True. I did the Dian Fossey hike in Rwanda and managed to see three gorillas on the way back down 🙂 But I’d love to go and do gorilla trekking on the Congo side and hike their volcano one day. They are even cheaper than Uganda and there’s a tour company that runs pickups from Kigali International Airport. It’s on my bucket list!